The Technology team works closely with our faculty to integrate multiple devices into the curriculum, and ensure that students have the technological resources they need to stray engaged and learning from anywhere. Technology at Bancroft starts with a solid backbone network using world-class equipment and systems from Cisco, Dell/EMC, VMware, HP, and Apple. Using Google Apps as a foundation, our systems are more accessible and secure than ever before. Beginning in Grade 2, every student has 1:1 access to a device for individualized learning. In Lower School (Grades 2–5), we supply HP Chromebooks for student use. In the higher grades, we are moving toward a program in which each Middle School student (Grades 6–8) has their own Chromebook, and each Upper School student (Grades 9–12) has their own laptop. 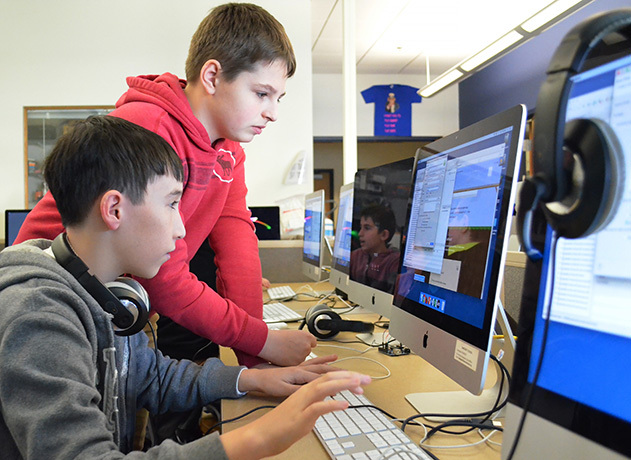 By making it easy to share resources, seek help, collaborate, and stay engaged with their peers and teachers far beyond the classroom, the 1:1 technology model is ideal for Bancroft’s active, project-based learning methodology.